Foolish Products has created a new development board called Whoa that takes the form of an open prototyping platform designed for wearable electronics capable of turning any EL (Electro-Luminescient) material into a touch sensor without the need for any additional hardware. Watch the video below to learn more about the features and functionalities of the Whoa Board which is now available to back via Kickstarter with pledges starting from $49 and shipping expected to take place during September 2016. The Whoa Board is also open source and Arduino IDE compatible making it easy to program and add to existing projects if desired. 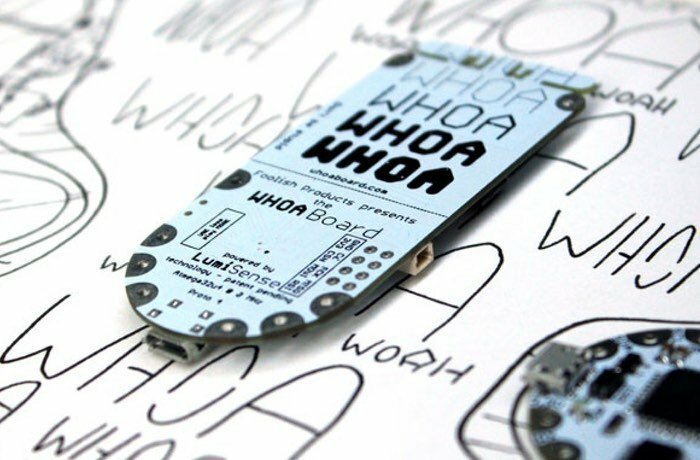 The creators of the Whoa Board explain a little more about its inspiration and design. It turns EL elements into capacitive sensing elements, a similar technique to cell phone screens. This means that it can measure presence at a distance. It has hardware pins for UART, SPI, and I2C. It can also output keyboard instructions or MIDI over it’s micro-usb port. This means that the Whoa board is flexible, and can be used to pass data to everything from a computer to a wireless module. When EL elements are integrated into clothes, these measurements are sensitive enough to detect movement. Jump over to the Kickstarter crowdfunding website for full specifications and more examples of its uses via the link below.